Vincent van Gogh (30 March 1853 - 29 July 1890) was a Dutch Post-Impressionist artist. Initially, Van Gogh worked with sombre colours until he encountered Impressionism and Neo-Impressionism in Paris. He produced more than 2,000 works including portraits, self-portraits, landscapes and still lifes. In the final two years of his life he cut part of his left ear off and, after suffering frequent bouts of mental illness, he committed suicide aged 37. 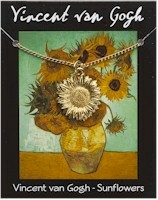 This Sunflower model is made from gold plated pewter and is supplied on a gold plated chain. The information card gives a brief outline of Van Gogh's life as an artist.